Former Recording Vice President Erwin Price died on April 10 at the age of 92. 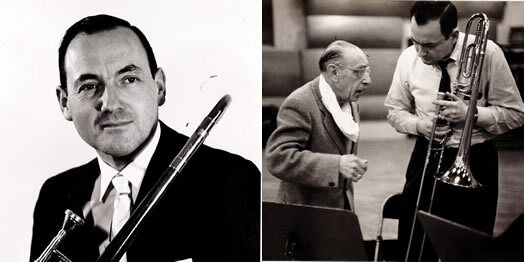 Mr. Price played under Igor Stravinsky in the composer’s famous recording sessions. We lost one of the great musicians of New York City on April 10. Trombonist Erwin Price was 92 and had been a member of Local 802 since 1946. Words cannot describe the magnitude of his career, which spanned over 50 years. A native of the Dorchester neighborhood of Boston, Erwin attended both the New England Conservatory and later the Curtis Institute. At the age of 20, while still at Curtis, he won the assistant principal chair with the Philadelphia Orchestra under the direction of Eugene Ormandy. The principal trombonist was Charles Gusikoff; he would host elaborate dinner parties for the other members of the orchestra. It was at one of these parties that Erwin met Gusikoff’s daughter Helen. They fell in love and later married. Erwin was soon drafted into the Navy. He played in the Navy Band, did a stint in Hawaii, and taught at the Navy School of Music. One of his students was the late, great Frank Rehak. After the war, Erwin was appointed principal trombone of the Pittsburgh Symphony. In 1947, Erwin and Helen moved to New York where Erwin embarked on a wonderful career as one of the most in-demand players and teachers. Erwin played on all the legendary recordings under Stravinsky. He was a founding member of the New York Brass Quintet and the Young Audiences chamber music series. He was involved in every facet of the music industry, and played principal trombone with the Joffrey Ballet, Long Island Philharmonic, and Orchestra De Camera. Erwin played the entire run of the Ed Sullivan show, and the entire run of the original Broadway production of “Fiddler on The Roof.” His tireless work as a member of the Local 802 Executive Board and as Recording Vice President was invaluable to every member of the union. He was very kind, respectful and supportive to anyone who approached him for any kind of advice. In 1974, I was accepted to the High School of Music and Art as a pianist. I was put in a brass class and handed a trombone to play. Things did not go well. I knew I need a good teacher. I approached Gabe Kossakoff, the chair of the music department, and asked him for a recommendation. His answer was, “Erwin Price is your man” I called Erwin, and Helen answered the phone. Sensing I was a bit nervous, she calmed me down with her incredible ability to do so. I studied with Erwin for the next eight years. I was in awe of the way he played, especially the clarity, beauty, and presence of his sound. Every articulation was like a pearl of buoyancy. Erwin is survived by his wife Rosie, children Laurence, Fred and Karen, daughter-in-law Jane and grandson Brian. Rest in peace, my dear friend.